A bicameral legislature is comprised of two chambers, often described as the lower house and the upper house. Usually, the composition of the lower chamber (with such names as the House of Representatives, House of Commons, Chamber of Deputies and Federal Assembly) is based proportionally on population with each elected member representing the same number of citizens. Upper chambers tend to be the smaller of the two legislative bodies. Members of upper houses customarily serve longer terms, but frequently possess less power than their lower chamber counterparts. The upper chamber (sometimes called the Senate, House of Lords or Federal Council) varies considerably in its composition and in the manner in which its members are selected through inheritance, appointment and indirect or direct elections. Some upper chambers reflect regional or state divisions, as in Germany and the United States. Citizens often exhibit greater confidence in those upper chambers where they participate in the selection of the legislators through direct or indirect elections. In direct elections, voters cast their ballots directly for a specific candidate or for the party they wish to see in power. With indirect elections, citizens elect local or provincial governments, who then in turn select the upper house members. Chambers formed by direct or indirect elections, unlike appointed or heredity chambers, are more accountable to the people and, for that reason, are deemed to be more democratic. Provide enhanced oversight or control of the executive branch. The authority of the two chambers in bicameral legislatures varies widely among countries. Some countries, such as the United Kingdom, utilize a “weak” form of bicameralism, in which one chamber enjoys superior legislative powers. The degree of predominance differs from system to system. Some upper chambers have the power to delay or review legislation adopted by lower chambers, while the duties of upper chambers in other legislatures are solely consultative. According to the Constitution of India, the union legislative body is called the Parliament. The Hindi term for Parliament is Sansad. The Parliament includes the President and the two Houses – the Council of States (Rajya Sabha) and the House of the People (Lok Sabha). This kind of system, with two Houses, is called a bicameral legislature. The Rajya Sabha (Council of States) is the Upper House of Parliament. The House has a maximum of 250 members, out of which 12 members are nominated by the President for their expertise in specific fields of art, literature, science, and social services. The remaining 238 members are elected by the members of the legislative bodies from the States and Union Territories. The Rajya Sabha is a permanent body and unlike the Lok Sabha, it cannot be dissolved at any time. Each member of the Rajaya Sabha serves for a term of six years. But one third of its members retire at the expiration of every two years. The Vice-President of India is the ex-officio Chairman of the Rajya Sabha. It, however, elects a Deputy Chairman from among its members who takes care of the day-to-day working of the House. Both Houses have equal legislative powers except in the area of finance where the Lok Sabha is given overriding powers. 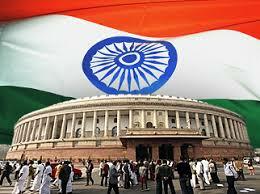 The Lok Sabha (House of the People) is the Lower House of Parliament. The members are directly elected to the House. The electorate consists of all citizens who have attained 18 years of age and are otherwise not disqualified to vote under the law. Under the Constitution, the maximum strength of the Lok Sabha can be 552 members. The Constitution provides that up to 530 members would represent territorial constituencies in the states, up to 20 members would represent the Union Territories, and two members would be appointed by the President to represent the Anglo-Indian community if there is inadequate representation of the community. The minimum age for qualification as a member of the Lok Sabha is 25 years. Each Lok Sabha is formed for a period of five years, at the end of which the House is dissolved. The House can be dissolved before the completion of the term or it can be extended by a Proclamation of Emergency. The period of extension cannot exceed one year at a time. A Speaker and a Deputy Speaker, elected by the members of the Lok Sabha, conduct day to day business. The Deputy Speaker presides during the absence of the Speaker. At the state level, the equivalent of the Lok Sabha is the Vidhan Sabha or Legislative Assembly; that of the Rajya Sabha is the Vidhan Parishad or Legislative Council. A second House of legislature is considered important for two reasons: one, to act as a check on hasty actions by the popularly elected House and, two, to ensure that individuals who might not be cut out for the rough-and-tumble of direct elections too are able to contribute to the legislative process. Opposition to the idea of Legislative Councils is centred on three broad arguments. One, they can be used to park leaders who have not been able to win an election. Two, they can be used to delay progressive legislation. Three, they would strain state finances. Opinion in the Constituent Assembly was divided on the question of having a Legislative Council. One-chamber, or unicameral legislatures, are most often established in countries structured on a unitary governmental system. Unlike the federal model, where power is distributed between the central government and constituent territorial units, power in the unitary system is concentrated in one central unit. The unitary model is generally found in geographically small countries with homogenous populations of fewer than 10 million inhabitants. Fewer elected officials for the population to monitor; and C reduced costs to the government and taxpayers. Delegation of powers means the powers passed on by the higher authority to the lower authority to make laws. Delegated legislation means the powers given by the legislature to the executive or administration to enact certain laws. The simple meaning of the expression “delegated expression” may be: When the function of the legislation is entrusted to organs other than the legislature by the legislature itself, the legislation made by such organs is known as delegated legislation. Delegated legislation, also referred to as secondary legislation, is legislation made by a person or body other than Parliament. Parliament, through an Act of Parliament, can permit another person or body to make legislation. An Act of Parliament creates the framework of a particular law and tends only to contain an outline of the purpose of the Act. By Parliament giving authority for legislation to be delegated it enables other persons or bodies to provide more detail to an Act of Parliament. Parliament thereby, through primary legislation (i.e. an Act of Parliament), permit others to make law and rules through delegated legislation. The legislation created by delegated legislation must be made in accordance with the purpose laid down in the Act. Delegated legislation is not a new phenomenon. Ever since the statutes came to be made by the Parliament, delegated legislation also came to be made by an authority to which the power was delegated by Parliament. There has been always a need for delegated legislation. The bulk of the business of the Parliament has increased and it has no time for the consideration of complicated and technical matters. The Parliament cannot provide the society with the requisite quality and quantity of legislation because of lack of time. Most of the time of the Parliament is devoted to political matters, matters of policy and particularly foreign affairs. Certain emergency situations may arise which necessitate special measures. In such cases speedy and appropriate action is required. The Parliament cannot act quickly because of its political nature and because of the time required by the Parliament to enact the law. In such cases quick action needs to be taken. In times of war and other national emergencies, the executive is vested with special and extremely wide powers to deal with the situation. There was substantial growth of delegated legislation during the two world wars. Certain matters covered by delegated legislation are of a technical nature which requires handling by experts. In such cases it is inevitable that powers to deal with such matters is given to the appropriate administrative agencies to be exercised according to the requirements of the subject matter. Parliament cannot provide for such matters as the members are at best politicians and not experts in various spheres of life. Therefore, it is convenient for the legislature to confine itself to policy statements only, as the legislators are generally ignorant of legal and technical skills. The practice of delegated legislation introduces flexibility in the law. At the time of passing any legislative enactment, it is impossible to foresee all the contingencies. Legislative amendment is a slow and cumbersome process, but with the aid of delegated legislation, the executive can meet the situation expeditiously. The practice of delegated legislation enables the executive to experiment. This method permits rapid utilization of experience and implementation of necessary changes in application of the provisions in the light of such experience. Experiments can be made and experience can be profitability utilized. A law passed by Parliament has to be in force till the next session of the Parliament when it can be repealed. In situations, which require frequent adjustments, experimentation is the only answer. Parliament while deciding upon a certain course of action cannot foresee the difficulties, which may be encountered in its execution. Accordingly various statutes contain a ‘removal of difficulty clause’ empowering the administration to remove such difficulties by exercising the powers of making rules and regulations. These clauses are always so worded that very wide powers are given to the administration. Government Ministers often consult interested bodies and parties before drafting statutory instruments. Delegated legislation is more flexible than an Act of Parliament. It can be passed quickly and easily amended or revoked, so that the law is up to date. Therefore, it allows rapid change. Delegated legislation helps in removing the difficulty clause and meet unforeseen emergencies expeditiously. Also helps in meeting situations of emergency and thus helps in reducing parliamentary pressure. Delegated legislation is not well publicised in contrast to debates on Bills in Parliament. Parliament has insufficient time to scrutinise the laws. Parliament is not reviewing legislation properly. Sub-delegation of powers a further problem, which causes complexity and confusion. It is impossible for anyone to keep abreast of all delegated legislation. The large volume of delegated legislation produced every year (some 3,000 statutes annually) means that it is very difficult for Members of Parliament, let alone the general public, to keep up to date with the present law. This is exacerbated by the fact that delegated legislation is made in private, unlike Acts of Parliament which are made following public debates in Parliament. The Indian constitution gives the law making procedure in Indian Parliament. The primary function of the Indian Parliament is to make, fresh laws and to revise or abrogate existing laws. non-money or, ordinary or, public bills. The procedures prescribed by the constitution for passing the two categories of bills are different. Procedure of passing ordinary or public bills-An ordinary bill has to pass through different stages before becoming an Act. An ordinary bill may be introduced in either House of the Parliament. The first stage is the introduction or the firstly reading of the bill. Most such bills are introduced by ministers. They are drafted by technical experts and approved by the Council of Ministers. Ordinary members of the Parliament may also introduce bills. One month’s notice has to be given to the speaker or, the chairman of the Rajya Sabha before the introduction of the bill. Then on a date fixed by the speaker or the chairman, the mover rises on his seat to move the bill. This is the introduction or the first reading of the bill which is a formal affair. No debate usually takes place at this stage. But on an unusual bill, for example the bill on Preventive Detention in 1954 may be opposed by the opposition at its very introduction. After introduction, the bill is published in the Gazette of India. The speaker or, the chairman may allow some bills to be gazette even before the first reading. Such hills do not require formal introduction in the Parliament. The next stage in the life of a bill is the Second Reading which usually takes place after an interval of two days after the first reading. At this stage, any of the four courses are adopted. The bill may be taken for consideration by the House at once. It may be sent to a select committee of the House. It may be circulated for eliciting public opinion. Very rarely bills are taken up for consideration straight way. When the 4th course is adopted, the secretariat of the House concerned request the State Governments to publish the bill in the State Gazettes inviting opinions from local bodies and recognized associations. Such opinions are circulated among the members of the House. If the bill is referred to a select committee, the mover selects the members of the committee, the Speaker or the Chairman appoints one member of the committee, the chairman of the committee. The committee makes a careful study of the bill and reports back to the House. The original bill along with the report of the Select committee is circulated among the members. It is at this stage that the bill is debated clause by clause. At two stages in the career of a bill debates take place. In the Second Reading when the bill is debated in principle and at the report stage, when it is debated clause by clause. The Second Reading is most crucial in the life of the bill while the Report stage is most important as giving final shape to the bill. After the bill is passed by a majority vote, it is submitted for the Third Reading. The Third Reading like the First Reading is only formal. No debate takes place and no bill is rejected at this stage. After the bill is adopted at the Third Reading, it’s transmitted to the other House where it goes through all the stages as in the originating House. The other House may accept the bill. In that case it is sent to the President for his assent. The other House also may reject the bill or, may introduce amendments not acceptable to the original House or, may not return the bill within six months. In any of such case, a constitutional deadlock develops between the two Houses. The President may call a joint session of the two Houses to resolve the deadlock. The Speaker or in his absence the Deputy Speaker presides over such joint sessions. The deadlock is dissolved by majority vote. Finally the bill passed by both Houses goes to the President for his assent. If the President assents to the bill, it becomes a law. The President may return the bill for reconsideration. If the bill is sent back to the President with or, without amendments, the President cannot withhold his assent. This complicated and time consuming procedure is adopted to prevent hasty legislation. The functions of Parliament are not only varied in nature, but considerable in volume. The time at its disposal is limited. It cannot make very detailed scrutiny of all legislative and other matters that come up before it. A good deal of Parliamentary business is, therefore, transacted in the committees. Both Houses of Parliament have a similar committee structure, with a few exceptions. Their appointment, terms of office, functions and procedure of conducting business are also more or less similar and are regulated as per rules made by the two Houses under Article 118(1) of the Constitution. Broadly, Parliamentary Committees are of two kinds – Standing Committees and ad hoc Committees. The former are elected or appointed every year or periodically and their work goes on, more or less, on a continuous basis. The latter are appointed on an ad hoc basis as need arises and they cease to exist as soon as they complete the task assigned to them. Among the Standing Committees, the three Financial Committees – Committees on Estimates, Public Accounts and Public Undertakings – constitute a distinct group as they keep an unremitting vigil over Government expenditure and performance. While members of the Rajya Sabha are associated with Committees on Public Accounts and Public Undertakings, the members of the Committee on Estimates are drawn entirely from the Lok Sabha. On 4 March 1997, the Ethics Committee of the Rajya Sabha was constituted. The Ethics Committee of the Lok Sabha was constituted on 16 May 2000.